This major trophy - for the Men’s Overall Championship at the Annual Intervarsity Rowing Championships is named in honour of SUBC alumnus , Dr Bill Webb and was initiated by The Boat Club and St Andrew’s College alumni in 2008 to commemorate Bill and his incredible service to Rowing Australia as long serving Team Doctor. Bill Webb served continuously as the Australian Rowing Team doctor from 1981 to 2003 and in addition served regularly and generously as a doctor to many rowers and coaches on an almost daily basis. Bill was closely involved from his days at Sydney University in the St Andrew?s College crew, first as a rower and for many years later as a coach. Bill also rowed for Sydney University at senior level and was a keen competitor and supporter of university rowing and Intervarsity competition. Shortly after being elected as President of NSW Rowing Association in 2004 Bill passed away suddenly. Rowing lost on of its most important volunteers and supporters. This year Australian University Sport has taken the decision to have a formal AUS Men’s Championship Trophy at the Australian University Rowing Championships, which will be held at SIRC from 1-3 October 2008. Alumni of SUBC, St Andrew?s College and the Principal of St Andrew’s have combined to purchase a trophy that will suitably honour the memory and service of Bill Webb for the overall Men?s AUC Rowing Champions. 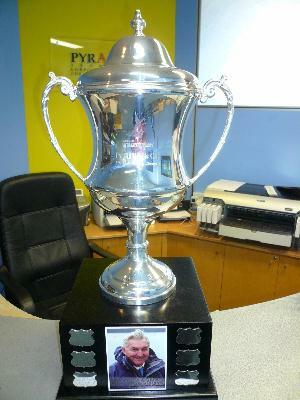 The trophy, a fine quality silver cup, is mounted on a base with 42 shields and a colour plaque of Bill Webb. Bill and Helen Webb’s daughters, Jocelyn, Kirsten, Diana and Catherine, will present it for the first time on the 3rd October at SIRC Penrith. contribution of Bill Webb to University Rowing and Australian Rowing. There is no question Bill had a passion for rowing. Following a distinguished career as an athlete while studying Medicine at Sydney University, he continued his involvement with the sport for the remainder of his life. He was involved at every level - with athletes, coaches and administrators alike. He always took the time to make every member of the rowing community feel comfortable and was never aloof. As a team doctor on tour Bill was available 24 hours a day and never on any overseas trip that I made with him did I see him flustered. On a personal level I want to pay tribute on behalf of my sister Ellen and myself for the mentoring he provided for both of us on many occasions. Bill was a wise man. Determined, passionate, striving for perfection, understanding, sensitive, kind, compassionate, warm ? these are just a few of the words that come to mind when I think about working with him. Dave Kenyon, Hugh Fisher, St Andrew's College - through Principal Wayne Erikson.